The Ebac DD400 Dehumidifier is the largest and most powerful unit in the DD range of Ebac Dehumidifiers using desiccant technology. The DD400 is designed for industrial and commercial applications where the operating conditions are too demanding for a refrigerant dehumidifier to be effective. In temperatures below freezing point, for example, a refrigerant dehumidifier is unable to operate at all whereas this type of dehumidifier will be effective tens of degrees lower down the scale. If extremely dry conditions are required a desiccant dehumidifier will continue to remove moisture from the air long after a refrigerant model has reached its limit. It is for these special requirements that the DD400 has been designed. The Ebac DD400 dehumidifier does not condense moisture from the air by passing that air over a cold surface in the manner of a refrigerant dehumidifier. A desiccant dehumidifier captures water molecules by using a desiccant material, silica gel, by means of a chemical process. A desiccant, or hygroscopic material, will absorb water from air until it is saturated. By applying heat to the desiccant the water is returned to vapour and the desiccant is thereby "regenerated" and will continue to absorb more moisture. 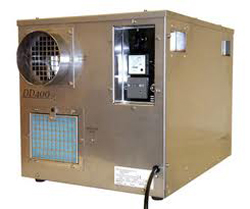 Desiccant dehumidifiers, like the DD400, vent the moist air to an area outside the drying area via ducting. This method allows the unit to be smaller and lighter, avoids the disposal of condensate but entails the consequent disadvantage of a ducted installation. The requirements of each operator will vary and the appropriate dehumidifier type will be chosen accordingly. In both types the moisture is removed by a slowly turning rotor which consists largely of silica gel, in this case 82% of the rotor is made up from the desiccant. During part of the rotation cycle the rotor is heated to remove the moisture and then re-enters the incoming air stream to resume moisture absorption. The Ebac DD400 incorporates a patented high efficiency rotor which is washable and designed for a long working life. Two features of the Ebac DD400 dehumidifier make it preferable to a refrigerant unit for certain applications. Refrigerant dehumidifiers are not suitable for use in conditions below freezing point. Ice forms on the coils at temperatures as high as 65°F and commercial grade refrigerant dehumidifiers use a variety of means to melt the ice by applying heat to the coils. This process becomes ineffective as the ambient temperature approaches freezing point and around 33°F is the lowest operating temperature in which this type of dehumidifier can operate. The DD400 uses a completely different technology to remove moisture from the air which does not require refrigeration, allowing the unit to operate in extremely low temperatures. The increase in operating temperature range is dramatic and the DD400 will continue to be effective in temperatures as low as -4°F, a full 36° below the freezing point of water. For this reason a desiccant dehumidifier is always preferred where humidity control is required in very low and/or sub-freezing temperatures. High temperature operation is possible at levels comparable to a refrigerant dehumidifier, up to 104°F. A unit such as the DD400 will be selected in preference to a refrigerant dehumidifier where extremely dry conditions are required due to its ability to reduce humidity levels far below those achievable by a refrigerant unit. Desiccant dehumidifiers cost more to purchase, and use more energy, than refrigerant units but are the only option where extreme dryness and/or very low temperature operation are essential. Like refrigerant units desiccant dehumidifiers extract different amounts of moisture at different temperatures and relative humidity levels. At the AHAM standard, 80°F and 60&RH, the Ebac DD400 will remove 81 pints per day. At saturation and a temperature of 100°F this rises to 108 pints while at 0°F and 10%RH the rate falls to 1.4 pints per day, impressive enough in such conditions. The Ebac DD400 is constructed using robust components, designed for heavy duty in adverse conditions. The unit is encased in a rugged, stainless steel casing which ensures that, inside and out, this is a durable machine. The DD400 is also compact for its power with exterior dimensions of 17 x 21.5 x 15 inches and easy to install where space is restricted. The DD400 incorporates a PTC Heater ensuring maximum drying is immediately reached and constantly maintained while the unit is running to improve energy efficiency. It also includes an ammeter to monitor the units drying effectiveness and a remote humidity sensor facility.